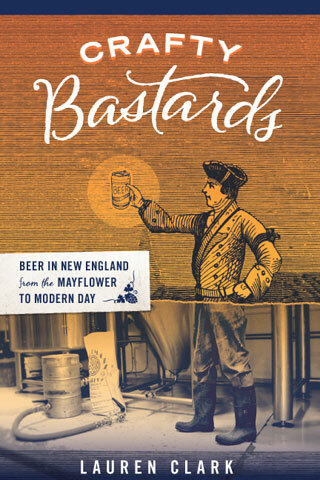 The latest happenings in and thoughts on Boston’s world of drink… First, ‘bad guy’ cocktails. OK, two cocktails does not make a trend, but maybe more will follow from this post, and then we’ll have conveniently manufactured one. (I love social media!) 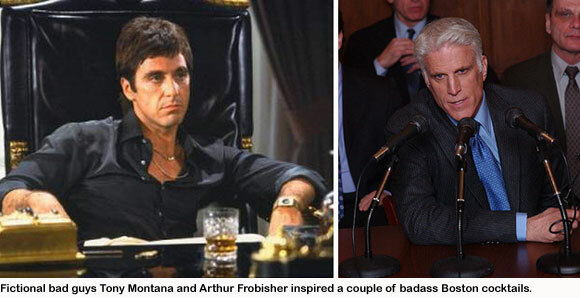 What I’m getting at are Eastern Standard‘s Frobisher and the Starlite Lounge‘s Tony Montana. I was delighted when Jackson Cannon, who, like me, is a devotée of the FX series Damages, told me he was naming a new cocktail on the menu after Arthur Frobisher, the Enron-inspired CEO played by Ted Danson. Frobisher stands out as a bad guy in a show populated almost entirely by bad guys (and girls — the protagonist is the ruthless high-stakes litigator Patty Hewes, played by Glenn Close). That’s because Danson has elevated playing an unmitigated tool to a high art form. Cannon celebrates that achievement with a stirred, straight-up mixture of 2 oz Oxley gin, 3/4 oz ES’ own rose vermouth, 1/4 oz Luxardo maraschino liqueur, orange oil and a Luxardo cherry. Then there’s the Tony Montana, which Beau Sturm is known to serve while uttering its name in the Cuban accent with which Al Pacino menaces his way through the gangster training video Scarface. The recipe: 2 oz Pyrat rum, 3/4 oz Carpano Antica, 1 barspoon Benedictine and 1 dash orange bitters, stirred well and strained. The thing about these drinks is that they’re not just ridiculous concoctions slapped with a badass name to get people to drink them. The cocktails themselves are badass — all spirits, straight up, not to be trifled with. Never mind that both Frobisher’s and Montana’s substance of choice is powdery and white, not fiery and wet. » Stoddard’s (48 Temple Place). My first impressions are pretty positive. The place looks beautiful, with its brick walls, massive, century-old bar imported from England, prints of old Boston, and local artifacts including old street lamps and corsets from an early incarnation of the Stoddard’s space (before its days as a cutlery shop of the same name). The lamb sausage sandwich and the steak frites over braised oxtail were really good, as was our bar service by Jamie Walsh. The Gin Sling and Stone Sour, both tall drinks over ice, were well made, but the Brandy Crusta was a bit watered down, and the Pegu Club was out-of-whack — too heavy on the Plymouth gin and without Angostura bitters to balance the orange flavors, as Stoddard’s house recipe strangely dictates. We were fortunate to get a peek at the already infamous, not-yet-open private club downstairs. For a membership fee of $2,000, you get your own key and entrance (in the Winter Place alleyway right next to Locke-Ober) to this low-lit den, plus privileges to use the space for meetings and parties. Stoddard’s was taken to task several months before it opened when a rumor circulated that the club would be men-only. That’s not the case, although Stoddard’s seems to really, really want to skew its demo to recreate a late-19th-century gentlemen’s bar, albeit with TVs. The bar staff appears to be entirely male, and General Manager Billy Lyons said that while membership for the private club is building, only two women have bought in so far. » If, the next time you go to Drink in Fort Point, you notice a lot more Europeans than usual, blame John Gertsen. He recently traveled to the 2010 Cocktails Spirits expo in Paris as the representative of an American cocktail bar. He gave a well-received presentation about his landmark bar, including a demo of the Chee Hoo Fizz, a cocktail invented by Randy Wong of the exotica orchestra Waitiki, which spearheaded Drink’s now famous summer Sunday tiki nights. While at the expo, Gertsen also encountered a bunch of rare spirits like Portuguese tequila from 1920 and a 1917 vipérine — booze flavored with a big, ol’ poisonous snake. Here’s a video of a good chunk of John’s presentation, and here’s another one of him and fellow Boston barman Scott Holliday (of Rendezvous) looking at the vipérine and other rare liquids with spirits collector George Dos Santos. (Thanks to Jörg Meyer of Le Lion Bar in Hamburg, Germany, for those videos.) Congrats, John!